More information about how a Chart Recorder works in this link. 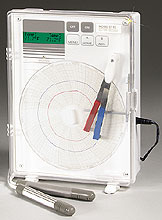 The CT82 is a precision two-temperature recorder with a digital display. The menu-driven setup is user friendly. Alarms can be high and low for each channel, with audible signal and relay contacts. Power is supplied via a 120 Vac 50/60 Hz adaptor. External power can also be supplied from any 12 Vdc source such as automotive or marine. Nota: Recorder comes complete with paper, one pen per channel, batteries and operator’s manual.